The following article explains how you can travel to Ayia Napa from Larnaca airport using public transport buses. To travel using public transport buses from Larnaca airport to Ayia Napa involves catching a bus from Larnaca airport to Larnaca city and then changing at Finikoudes bus stop for a bus to Ayia Napa. 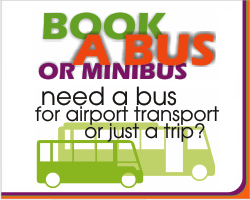 There is no direct public transport bus from Larnaca airport to Ayia Napa. There are frequent bus services to use during the day but please be aware that services are less frequent in the evening and no services will be available during night hours. Cost for the journey from Larnaca airport to Finikoudes is 1.00 Euro. Once you arrive at Finikoudes you can then use either bus 711 or the intercity bus Larnaca-Famagusta. Bus 711 is a Famagusta bus which stops at several bus stops in Larnaca and Famagusta Area. The approximate travel time for Ayia Napa is 90 minutes. The cost for a ticket is 1.00 Euro. See details about bus 711, including time schedules, at http://www.cyprusbybus.com/routedetails.aspx?id=207. Intercity Bus Larnaca-Famagusta is an intercity bus and will stop at fewer bus stops. The estimate travel time for Ayia Napa is 50 minutes and the ticket will cost 3.00 Euros. See details about the Intercity Bus Larnaca-Famagusta including time schedules at http://www.cyprusbybus.com/RouteDetails.aspx?id=187. The total cost for the journey from Larnaca airport to Ayia Napa will be 2.00 Euros per person if you use the 711 bus from Finikoudes to Ayia Napa or 4.00 Euros per person if you use the intercity bus Larnaca-Famagusta. Seats cannot be booked in advance and tickets can be bought from the bus driver before using the service. An alternative to the public transport buses is to use a taxi. The cost to Ayia Napa for a 4 seat taxi will be 50.00 Euros and 68.00 Euros for a 6 seat taxi. To book a taxi service complete our booking enquiry form.